Keeps track of performance of memory, latency, and framerate. Any chance of an update on this addon, along with the durability one? The current ones no longer work . I really love and miss this addon. Even broker CPU / memory can't replace it. looking for a lightweight but as efficient alternative (Broker)? Looks to be broken in 2.4.2, had to shut it off. Looking forward to an update, 'tis a great mod! EDIT: Looks like there is a new version at http://files.wowace.com/FuBar_Perfor...formanceFu.zip. I have not tested it yet, but I'm sure it'll work with 2.4.2. 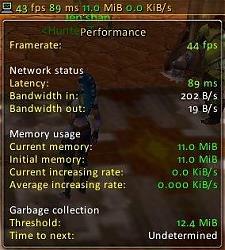 I tested r76217 linked from wowace and sadly it's lagging me out every 10-15 seconds if I have "Show addon usage" enabled. Last edited by geekgirl101 : 07-12-08 at 04:19 PM. Last edited by bleemus : 05-15-08 at 08:32 AM. Any chance of a update so it dont need ace at all ? You don't need Ace. This runs on EMBEDDED Ace2 libraries, so nothing extra is needed. If you mean removing the embedded libraries, well, I can say for sure this will rpobably never ben taken off those. Those libraries are responsible for quite a bit of the lightweight, efficient part of this addon. There's really no benefit to removing them, and it would only really hurt the addon. Last edited by Nefarion : 04-04-07 at 04:58 PM. anyone got this working with the latest patch 2.0.3? It seems that a fair few FuBar plugins are flagged as Load On Demand. 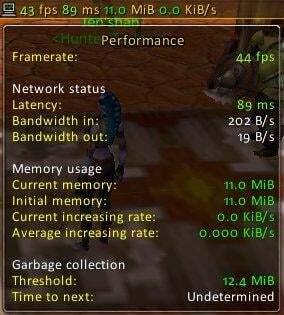 For some reason, even when they were enabled in the last gaming session they refuse to load automatically under WoW 2.0.3. Hopefully FuBar can be fixed to cure the LOD issues shortly. In the meantime you can manually force the plugins to load by using a mod such as MCP ( http://wow.curse-gaming.com/en/files...ntrol-program/ ). Is there a standalone version to this? I'd just like something that shows FPS, Latency, and optionally the Mem use. One small complaint, when I have the option selected to show me when garbage collection is going to occur, it spams me constantly, with "garbage collection in 9.4 minutes, "" in 2 minutes, "" in 45 seconds, etc. It's not uncommon for me to have an entire chat window full of GC collection notices. I like being alerted to when it's going to occur and when it did occur, however the constant notices get a bit annoying. Any chance of just making it alert me only when, for example, it will happen in 30 seconds? This way I get a 30 second heads up, and then a notice that it did occur. Any plans on updating this for Fubar 2 ?